Heat 2 sps oil in pan and add chopped onion, tomato, green chili, garlic and ginger. Cook on medium flame till the veggies are well cooked. Let them cool and grind it to smooth paste. Now make a tempering heating 1 sp oil. Add mustard, cumin, red chili, curry leaves , hing and udad dal. Add this tempering to the chutney and serve with dosa, idly or any kind of pakoda's. Can be stored in refrigerator for upto 4 days. Grate raw mango and keep aside. Add chili powder,haldi and salt to it and mix well. Now add Oil and mix well. In apan heat 1sp oil and add mustard seeds, fenugreek seeds, red chili, udad dal and curry leaves. Fry for a minute and add this tempering to to the mixed pickle. 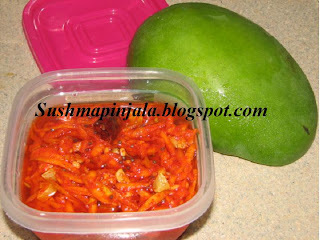 That's it yummy instant mango pickle is ready. Leave this for a day in a air tight container. Can be used from the 2nd day with hot rice, dosa, idly etc. Can be stored for 4 to 5 days. 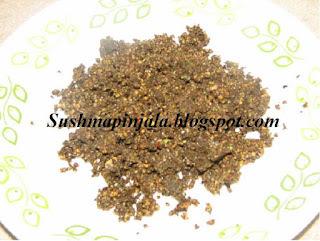 Today I made Spice powder with Chinta Chiguru ( Tender tamarind leaves). We do not get these leaves in US. In my recent visit to India I found these leaves. Bought them and dries them in sun and stored them in a dry place. This way we can use these leaves any time of the year when u do not get these. As these leaves are seasonal people usually dry them and use it year long. We can use these leaves in many recipes like making dal, curry or specially used in chicken or mutton. Today I made spice powder with it to serve with dosa . Tender Tamarind leaves are in green and red color. I didnot have the pic of fresh leaves so copied this below image from google. Dry roast curry leaves and keep aside. In few drops of oil saute garlic cloves and remove from heat to cool. 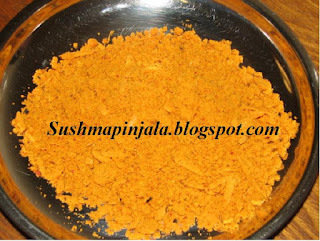 In a blender or mixer add dhaliya, salt, chili powder, curry leaves and garlic to make fine powder. That's it putnalu podi is ready to serve. Can be served with dosa, idly, chapati as a side dish. Can be served with hot rice adding little ghee. It can also be served with bread. Toast 2 slices of bread and spread little spice powder and few drops of ghee or oil and serve. Can be stored in dry place for more than a month. 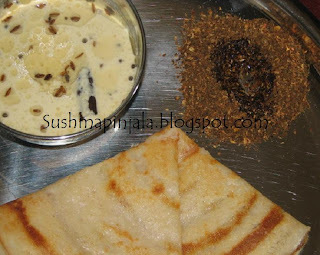 Also sending this recipe to Gayathri's WTML event. Heat oil in a pan and add udad dal and chana dal. Once they turn light brown remove and keep aside. Add red chili, cumin, garlic and curry leaves in rest of the oil. Fry them on medium flame for 5 minutes and remove from heat. Let them cool. Now add these to coconut and also add salt and haldi. Make it to course powder in a blender. Serve with roti, hot rice, dosa or idly. Can be stored in a box for more than 2 weeks. Clean the cilantro and transfer to blender. Add chopped green chilies and garlic cloves. Add salt and grind it to course mixture but not paste. In a pan heat oil and add udad dal. Saute till golden brown and add the cilantro mixture. Mix well and cook on low flame till it becomes dry powder. Mix in between so that it does not burn at the bottom. Let it cool and transfer it to air tight box. Serve with dosa idly or hot rice. It tastes good with toasted bread too. Can be stored till 10days. Its been a long time that I have posted a new recipe. Was busy with India trip. Anyways am back with the lovely recipes again. Today is the first day of BM # 16 and my theme is "Shelf Friendly Dishes" . 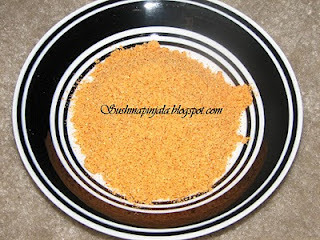 For the day one am here with Dhaniyala podi or spice powder made with coriander seeds. Here goes the recipe. 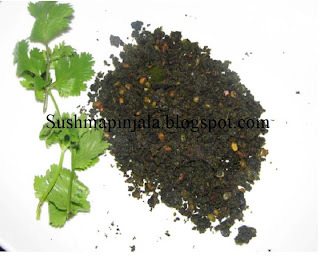 Coriander seeds 1cup Red chilies 8 Curry leaves 15 salt to taste Tamarind lemon size. Dry roast coriander seeds and red chilies. Now add curry leaves. Saute for 2 minutes and add tamarind. saute for few seconds and keep aside to cool. Now make a powder out of it in a blender adding salt to taste. 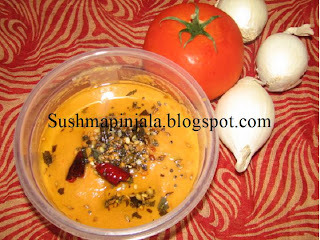 Can be served as side dish for dosa , idly or with hot rice and ghee. This powder can be stored in air tight box or container for more than 10days.